For those of you who read the blog regularly (your not alone over 5000 do every week) you will know late last year we were the first tuning company in the world to develop and offer full ecu remapping and tuning for the Aston Martin Vantage. 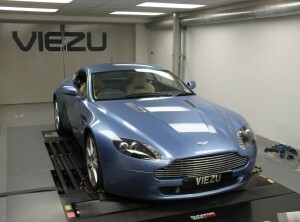 At the time we released a significant range of Aston Martin Vantage tuning services. However, a true tuners work is never done, this week we returned to Aston Martin tuning and development work with our Blue Optimize caps on, Blue Optimize is Viezu’s award wining carbon reduction tuning, its exclusive to Viezu and only available through authorised Viezu Dealers. After very considerable dyno time and tuning development word we are very pleased to confirm the results of the Aston Martin ECU remapping. A 50% reduction on Co2 output, testing and inline with UK MOT regulations. And we have achieved this on the Aston Martin Vantage whilst still confidently delivering and additional 22-25bhp and 30blft of torque. In fact the peak bhp rise is closer to 50bhp, and comes in perfectly as the AMV8 really comes alive 4800rpm. Nobody in the world is offering this level of custom tuning for the Aston Martin – and through our worldwide dealer network, we can tune your Aston Martin where ever you are. Here is an Aston Martin tuning video www.youtube.com/watch aston martin tuning.